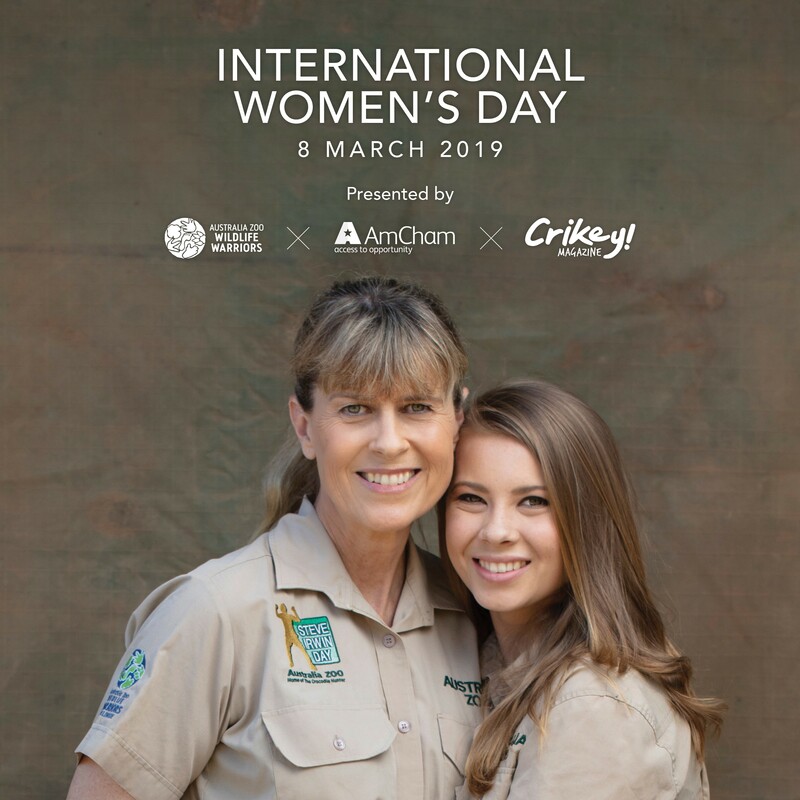 Australia Zoo Wildlife Warriors, AmCham and Crikey Magazine proudly present a celebration of International Women’s Day 2019 at Australia Zoo! On Friday 8 March 2019, AmCham will have the pleasure of welcoming two of Australia’s most popular and passionate conservationists, Terri and Bindi Irwin, to address this prestigious event and share their incredible stories as Wildlife Warriors. Hear from the Director of the Australia Zoo Wildlife Hospital, Dr Rosie Booth, on conservation efforts here in Australia. And finally, we introduce you to The Black Mambas, a group of truly inspiring women who have made it their mission to protect wildlife in South Africa without weapons or violence. The Autumn edition of Crikey Magazine, showcasing these remarkable stories and commemorating International Women’s Day 2019 will be launched at the brunch with each guest receiving a signed copy from the Irwin family. Learn about the inspiring stories of these female leaders while enjoying free-flowing champagne, a delicious seated brunch full of delights, a meet and greet with Australia Zoo's wildlife and gifts galore! Guests will have the option to self-drive or take advantage of the return coach transport from Brisbane CBD. This event presents the ideal opportunity to expand your network, meet with colleagues, and build relationships to further your business. This formal networking brunch will attract businesses of all sizes from a wide range of industry sectors. We encourage attendees to book a corporate table to host clients, thank colleagues and of course network within the industry, taking advantage of such a large number of high calibre professionals in one room. This event will raise funds for conservation and research initiatives led by women. Book a table of eight and have the opportunity to host a branded corporate table - an ideal opportunity to invite guests. All attendees enjoy complimentary return coach transfer from the Brisbane CBD organised by Australia Zoo. Return coach transfer departs from The Sebel Brisbane at 7.15am sharp. Terri Raines was born in Eugene, Oregon, USA on the 20 July 1964. Her father drove heavy-haul trucks and would often bring home wildlife that had been injured on the road. This instilled in Terri a love for wildlife and a desire to help animals from a very early age. At 20, Terri was running the family business, worked part-time at an emergency veterinary hospital and operated a wildlife rehabilitation organisation called 'Cougar Country', rehabilitating and releasing predatory mammals such as cougars, bears and bobcats. It was not long before she was caring for more than 300 animals each year. During a holiday to Australia, Terri visited the 'Queensland Reptile and Fauna Park'. She was captivated by the enthusiastic man in the khakis, talking so passionately about crocodiles. Terri introduced herself, realising they both had in common their passion for wildlife and conservation. This chance encounter would change their lives forever! Steve and Terri married on 4 June 1992. The wedding was a huge occasion, with all of Terri's friends, family and colleagues realising they would be saying goodbye as she started her life in Australia with Steve. Terri and Steve immediately began their life together with wildlife documentary filming, an amazing zoo, and later two incredible children, along with a stack of adventures. Steve and Terri's wildlife documentaries brought Australia Zoo to the world stage, attracting visitors from across the world to the Sunshine Coast. While Terri lost her soulmate Steve, she continues to be a passionate wildlife spokesperson and conservation icon. She actively speaks out and supports conservation issues around the world. Terri is determined to dedicate the rest of her life to wildlife and conservation, fulfilling Steve's legacy with the support of Bindi and Robert. Australia Zoo has always been her home. Every animal is part of her family. She could not get through her day without connecting with the animals around her, particularly the echidnas which are her favourites. Bindi made her television debut through The Crocodile Hunter and has a naturally kind and engaging personality. As Bindi: The Jungle Girl, she used her enthusiasm for wildlife to help educate others, both young and old, about the importance of caring for wildlife. The Irwin’s latest project is Crikey! It’s the Irwin’s, a show on Animal Planet aired in over two hundred countries and territories that follows the families work to continue Steve’s legacy. Dr Rosie grew up in Toowoomba, Queensland, surrounded by nature and animals. She enrolled in Veterinary Science at the age of 16. Following graduation and five years in mixed practice, Rosie undertook a Master’s Degree studying the koala adrenal gland and its role in koala stress syndrome. During her post-graduate studies, she was offered a position as the first full time Veterinarian at Lone Pine Koala Sanctuary with a population of 80 koalas. That position led to an offer of employment with the Zoological Board of Victoria which allowed Rosie the opportunity to participate in a number of Zoo breeding programs for threatened species. In 1995, Rosie represented the Australian Association of Veterinary Conservation Biologists and AusAID by providing training to Nepalese Veterinarians on wildlife management. From 2004 to 20011 Rosie worked as the co-ordinator of zoo breeding of threatened species for the Queensland government. During this time, she was able to manage the re-introduction of 172 individuals of six species. Rosie has continued her commitment to conservation, research and wildlife rehabilitation by taking up the position of Director of the Australian Wildlife Hospital. Under Rosie's leadership, the hospital will continue to contribute to research with direct conservation outcomes and promote a harmonious co-existence between humans and wild animals which share our planet. The fictional female warriors of Wakanda from Marvel’s Black Panther don’t have anything on these women! Founded in 2013, the Black Mamba initiative was developed to combat the ever-growing threat of poaching in South Africa’s Balule Nature Reserve. The first female anti-poaching team in South Africa proved so successful, their area of operation has expanded to cover the entirety of the 52,000ha reserve, part of the Greater Kruger National Park. They strive to make their area of influence the most undesirable, most difficult and least profitable place to poach any species. With a passion for wildlife and rhino conservation, these women are the voice in the community through their conservation work. Since the deployment of the Black Mambas, snaring in the reserve has dropped by 99%, they have assisted in over six arrests and identified and destroyed more than twenty-nine poachers’ camps and seven bush meat kitchens. Their record speaks for itself, but these women are not just idols of anti- poaching, they are idols as women in a time that we need to celebrate iconic women of the world.